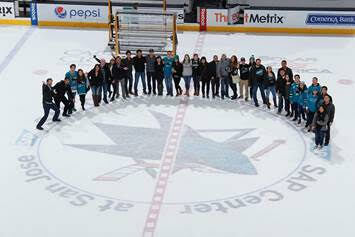 San Francisco, Fresno, and San Jose YMF’s joined forces to catch the Sharks beat the Colorado Avalanche in an exhilarating overtime win on January 21st!! The night started off with pre-game appetizers and extreme networking as we gathered at the Old Wagon in downtown San Jose at a force of 40 people! It only proceeded to get better as we moved on to an intense game with a 3-2 win in overtime, followed by an incredible group photo on the ice! This annual event only continues to surpass expectations each year. Looking forward to many more joint events in 2017! San Jose YMF hosted its annual Sharks Game event on January 21st. YMF members from San Jose, San Francisco and Fresno met up before the event for a pre sharks game networking hour at the Wagon in downtown San Jose. There were over 40 members, family and friends that attended the event. The hockey game was an exciting match and ended in overtime with a Sharks win 3-2. Overall it was a successful event and we look forward to hosting it again next year. Continuing on the success of past joint happy hours, please come join ASCE SF YMF, AIA SMC, WIA, AIA EPC, IIDA for a social after-work happy hour and networking event! Meet and connect with industry professionals from other organizations. Some drinks and food/appetizers will be provided on a first come first serve basis. Space is limited so please RSVP early. The ASCE San Francisco Section is excited to kick off Engineer’s Week and our Dream Big Student Outreach Program with a Red Carpet Premier of Dream Big: Engineering Our World. Dream Big is a giant-screen film about engineering that will take viewers on a journey of discovery and show audiences how engineers are developing the world of tomorrow. The premier is an opportunity to network with other industry professionals, celebrate the industry and the innovation that continues to bring society to new heights, and to inspire a new generation to reach for the stars in an industry that is at the center of our world. Join us at the Tech Museum at 5:30 for hors d’oeuvres and no-host bar before the movie screening at 7:30. The movie runs for approximately 1 hour. You do not want to miss this premier event! 8 SF YMF officers and members attended Western Region Younger Member Council in downtown Los Angeles at the beginning of January. We met ASCE leaders, students, and other younger members from California and west coast. Upcoming in February, we are hosting Habitat for Humanity with Stanford’s Sustainable Design & Construction Graduate program, a presentation at SFSU, and writing contest. We are also planning a joint ski trip to Tahoe with Reno YMG.